Some cookies on this site are essential, the site won't work as expected without them. These cookies are set when you submit a form, or interact with the site by doing something that goes beyond clicking on simple links. We also use some non-essential cookies to anonymously track visitors or enhance your experience of the site. 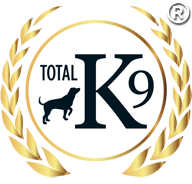 TOTAL K9 ® does not permit third party organisations to set or access TOTAL K9 ® cookies on your browser. By continuing to browse www.totalk9.co.uk it is understood you accept these terms and conditions.